Spring has sprung! And with that comes flowers blooming, pollens circulating the air, and unfortunately for me allergies. I began the week, Monday, waking up with a scratchy sore throat and my nose stuffy. Yuck. I told myself I’m not getting sick, this will pass. I jumped out of bed and went straight for my netti pot…the best holistic remedy for allergies or anything nasal related. It’s like rinsing off your body, rinse your nasal passage! 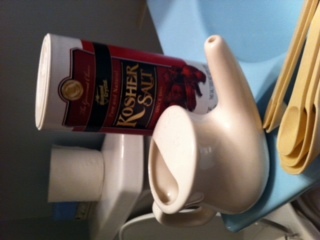 I filled it with some warm water put some kosher salt in it, mixed, and began flooding my nasal passages. There are certain recipes, saline solutions, for the Netti, but I just mix and blend at will. Not the most pleasant feeling, but it works. I did it every morning, sometimes twice a day, and by Friday I was feeling great. 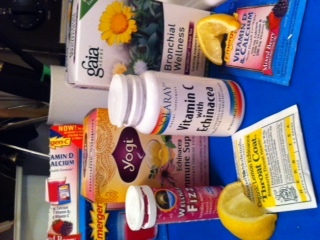 I added some Echinacea and vitamin C, a few emergency packs, and lots of herbal tea and lemons. Not going to lie, I did take benedryl for a couple nights to help me get some ZZzzZZzzz’s. Health restored in a few days and back to my own fabulous me! It just took a netti pot, some vitamins, and a little bit of hot yoga to sweat it out. Hello Spring! It’s good to get into a routine of using the netti pot, especially if you are cleansing or the seasons are changing. It’s a fabulous Ayurveda tool! It’s weird at first, maybe even gross, and unpleasant, but once you feel the benefits, you will be hooked. No pill, just pure natural h20 and some salt, thank you Mother Earth! But life gets busy, time is short, and mornings are hectic…you can always count on the netti for a rising discomfort, allergies, or nose issue. It’s easy, simple, and has only positive side effects, and no drugs! Dr Oz even recommends it! – Use non Iodized salt and maybe baking soda, mix with water ( 1/2 teaspoon to 8 oz water recommended)…give or take a little. I don’t use baking soda, but I’ve heard good things. Iodized salt can cause irritations overtime. – Always lean your head to the side, over a sink, and pour netti through opposite nasal passage. The water should run down opposite nostril. If you feel it in your mouth/throat you are not tilting your head enough.